The answer is, “It depends….” However, once you are armed with a few good blanket facts, life with (or without) a blanket becomes much easier. With this information and a little consideration, you can come up with a good strategy for your individual horse’s needs. LOFT – The warmth in a horse’s winter coat does not come from the mass of hair, but rather the way the hair stabilizes the air immediately next to the horse’s skin, creating a layer of insulation. You might think of it like a thick down jacket. LIGHT – Horses begin growing their winter coat as a response to the shortening daylight. Keeping your horse “under lights” will reduce the growth of their hair coat—whether they wear a blanket or not. There are articles upon articles about this subject, too, but a rule of thumb for having a horse “under lights” is that he should have a light bright enough to read a newspaper for 12-15 hours a day (keeping the lights on continuously does not have the same effect). You, of course, have the option to supply your horse with a good book instead of a newspaper. WIND – A cold strong wind blows the loft right out of their coat. WET – A soaked horse will have a compressed loft, and just like with us, being wet makes the cold colder. A horse with a natural winter coat is fine in a light rain, though. The coat is designed to shed water right down to the long hairs on the fetlocks. 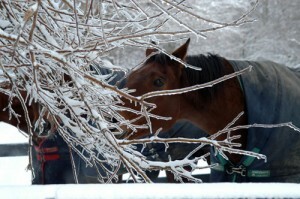 SHELTER – Help your horse stay out of the WIND & WET. FOOD – The energy of digesting hay produces internal warmth for the horse. While it’s always important for his health that your horse mimic the diet of the constantly grazing horse as closely as possible, in the winter, this is important to help keep him warm. THE HERD – If your horse is low in the herd hierarchy, he may get pushed out of the shelter or run off from the hay. WORK – The decision whether to blanket or not also relates to the amount of work you intend to do. Keeping a horse blanketed and under lights so they have a light coat significantly reduces your cool down time after a workout. The longer a horse is sweaty, the more opportunity he has to get chilled. WARM RAIN to COLD SNAP – Horses with access to shelter will stand out and soak themselves in a warm rain, not knowing that the temperature is going to drop dramatically before they get dry overnight. BLANKETING FOR EXTRA WARMTH – When January rolls around and you feel like your horse could use a little extra warmth, putting a light sheet on doesn’t add a layer to make them a little warmer, it compresses the loft without replacing it with a man-made substitute. It may seem counter-intuitive, but you have the blanket a thick-coated horse almost as though they have no winter coat at all. THE SNOW BLANKET – A horse wearing a snow blanket has a portable igloo and he’s fine wearing it outside. But if you bring him inside, knock it off so the snow doesn’t melt quickly and ruin his loft.